No, I’m not talking about the oft used mantra of some workout routine, or the now used battle cry during this current political campaign, but rather an activity currently firing up, if you’ll pardon the expression, with Blue Heron Ministries. 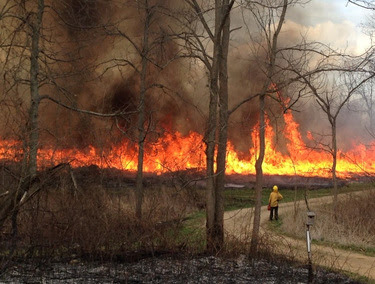 One of the many tools of land restoration is the reintroduction of fire to the landscape. The ideal times for such are early spring while things are dry, new growth has not started, and breeding animals are not active; or late fall when again things are dry and the business of seeding and breeding have been accomplished. There are rare times when fire can be used in winter and summer, but these are not too common, for reasons mentioned. We do though, sometimes get a jump on the season and such may be the case in 2016. On February 23, a crew of four BHM workers conducted the first prescribed burn of 2016, the first ever February burn done by BHM! About nine acres in two separate parcels were carefully set afire at the Lake George Conservancy Nature Preserve. One has been actively planted and nurtured for meadow plants and both will progress nicely in that direction with this late winter’s help of fire. With this relatively snowless winter, periods of no rain, warmer temperatures, and continued predictions for the same; this might be one of the earliest burn seasons. Depending on how conditions hold, it could be one of the most thorough. Of course, sometimes a quicker beginning results in a quicker ending if things warm up to the point where amphibian and reptile populations, certain bird species, and other wildlife get a jump on moving throughout their habitats and begin the breeding process. Great care is taken to minimize the potential harm of any wild animal, including the insects for which we manage these unique areas. Simply put, we practice good stewardship in every sense of the word. In 2015 we were able to conduct burns into April. One burn in early April, near Tamarack Lake was done early enough to avoid any chance meetings with the endangered massasauga rattlesnake. Proper clothing and techniques protect us from the snakes, and proper timing of our work protects the individual snakes from our activities. Later in April we are able to move into higher grounds, as shown in photographs from last year, of a restored upland prairie adjacent to the Fawn River, and in Conservation Reserve Program (CRP) land near Hamilton. 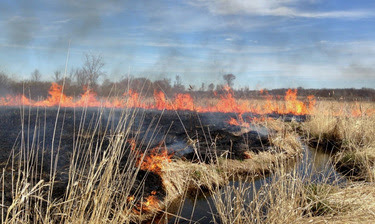 Keep your eyes open for any E-mail announcements of demonstration burns conducted by BHM this spring If conditions can be predicted and it is convenient for public observation, you will be notified. Of course, the best enjoyment is to join any of our field trips later in the year, or visit some of the public areas we burn, to see the results in late summer, as prairie and open-woodland plants respond to fire and flower in full bloom! Easy to visit sites are Cedar Swamp Wetlands Conservation Area, Hamilton’s Fish Creek Trail, Fremont Public Library, and Spangler Grove at Clear Lake. This article was featured in the March edition of Rustling Grass, a monthly e-newsletter published by Blue Heron Ministries. To read the entire edition, visit our archives page. To receive them directly to your email, let us know at stuartbheron1@hotmail.com.